Added by John Partridge at 15:44 on Wed 28th Dec 2011. 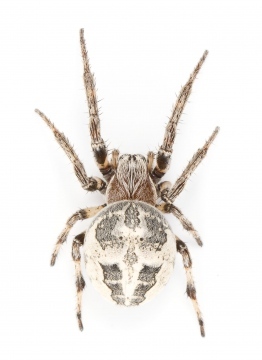 Jon Daws has written to say that back in March he found nine immatures and sub-adults of Larinioides cornutus in a tight group under loose bark. He is curious to know if they had been overwintering in this way and, if so, do other species spend the winter communally ? Added by John Partridge at 15:38 on Wed 28th Dec 2011. The attractive Araneus cornutus is a well-known inhabitant of wet areas especially in coastal districts. Along the boulder-clay cliffs of the River Mersey, south of Liverpool, Lancashire, it is a common spider on the heads of various plants, particularly Phragmites communis, Carex arenaria and Dipsacus fullonum. On the 1st September 1972, at Speke, below Liverpool Airport, the compact silk-sacs of this species were very common and conspicuous on these plants. On examination of about 30 of these sacs, it was found that nearly all were occupied by a male and female together. A number of others contained females only, whilst some were empty but none were found containing males only. On this day, I took a male and a female home for observation and placed them in a corked glass tube. Shortly after being placed in the tube, both spiders abandoned the sac which soon disintegrated. However, the female spun a new one which was a flimsy affair compared with the first, and the spider could easily be seen through it. Apart from this, both spiders remained almost motionless for long periods but on the 5th September the female moulted her carapace (which slit along the lateral borders) legs, sternum and epigyne, but not her abdomen. Similar cast skins were noticed on several silk-sacs at the Speke site on the 1st September, so it must be the usual state of affairs to moult at least once in the sac. FOOD The spiders were feed regularly on various flies, especially House Flies and on the spiders Zygiella x-notata (Clerck) and Ciniflo similis Blackwall as well as three Ladybird Beetles Adalia bipunctata. On the 9th September, the female caught and killed a house Fly taking approximately 40 minutes to devour it. She held it by the ventral surface of its body and gradually imbibed its body fluids, eating everything except for a tiny black mass containing leg fragments. She then spent some considerable time cleaning her chelicerae and palps with the tips of legs I-II. On the 6th October at 13,55 hrs, she seized a ladybird by the ventral surface of its abdomen and held it aloft, sitting back on the tip of her abdomen supporting herself with legs II, III and IV or sometimes legs II and IV. Also whilst holding the beetle, she sometimes walked around the tube with it and occasionally held it whilst suspended upside down from her web strands. After about an hour, she released the beetle which surprisingly,was still alive and uninjured except for a damaged leg. It was then ignored. At this time a house fly was placed in the tube but the spider also ignored it. In fact the fly walked freely over the spider without the latter reacting in any way. But within two hours, its partly eaten remains lay at the bottom of the tube along with the wing cases of the ladybird. On the 2nd October, a batch of eggs was laid by the spider during the night and these were deposited in a flattish disc-shaped web, which was attached to both cork and glass. The egg cocoon was reddish brown and somewhat wet looking. Some web strands immediately surrounding the eggs were decidedly pale greenish- yellow in colour. It was noticeable that after the laying, the folium on the females back became darker and more contrasting in colour. Her general behaviour now was to rest close to the eggs and often she would either sit on top of them or straddle her front legs across them. On the 24th October, the web was accidently torn by myself but the spider made no attempt to repair the damage. On the night of the 8th November, a second egg batch was laid Again these were brown in colour and suspended in a sheet of web. By this time,the first egg-ball had been abandoned and became covered by what appeared to be mould growth. The male did very little in the tube apart from shifting his resting positions. Sometimes he became more active when the female was feeding, as if he was aware somehow of the presence of food. However, in spite of this he ate only one fly as far as I know. At no time did I witness copulations between the sexes which happened either during the night or before I actually found the male with the female at Speke. The male died on the 4th October and the female 3rd December. At Speke I found several immature specimens of various sizes in December and also in August. None were in silk sacs. Several were found in the heads of Teazel, resting abdomen outwards. Not one adult was found at the Speke site in mid- December. I concluded that the silk-sacs were built by females solely for mating purposes and that these are found by males possibly by vertical migration in spring from ground level where most immatures appear to live in winter. That immatures do not build silk-sacs. The male normally dies soon after mating and the female dies after laying at least one or two egg batches at the end of the autumn after the first frosts of winter.